This website is designed to promote hip hop kreyol tracks, as well as the raggae, ragga, and danchall tracks in the movement. Artists in the area mentioned above are welcome to send us their tracks (MP3’s) to be heard by our visitors at (allrapkreyol@gmail.com). In addition, for MIXTAPES, we’ll only accept the DOWNLOAD LINK from the artists’ websites or from a file sharing website such as DropBox, Google Drive, and others…. Spread the words people. Let others know about this website. 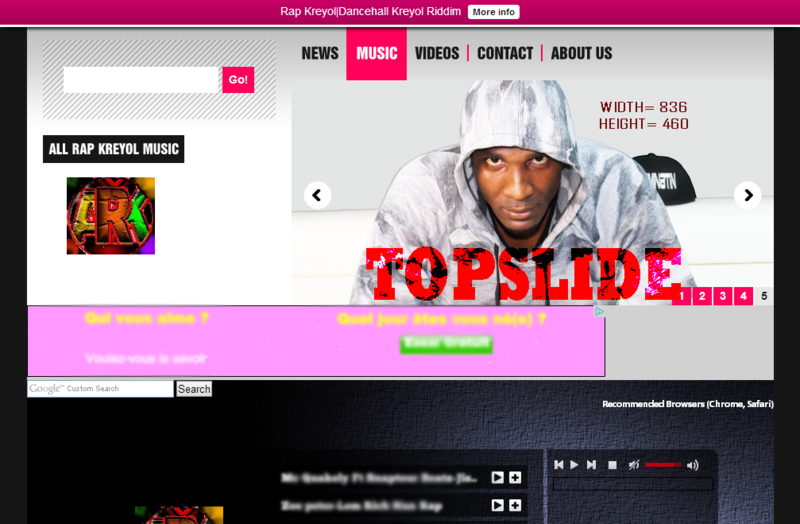 Website sa a la pou pwomote HipHOP KREYOL tracks, Raggae, Ragga, ak Dancehall tracks nan mouvman an. Atis ki fè tout jan de mizik sa yo ka voye tracks yo (MP3’s) ba nou sou allrapkreyol@gmail.com pou’n poste pou vizitè yo. Pou atis ki gen MIXTAPE yo, nou selman aksepte (DOWNLOAD LINK) ki ka nan website atis la oubyen link ki sot nan Dropbox, Google Drive, and kek lot…. Youn di lot. Di fanatik ou ki kote mizik ou poste. One love, Tout rap kreyol artist yo. ARK la pou ede nou promote rap kreyol mouvman an. Alò, ede’n pou’n ka ede’w pi byen. Atis/Gwoup ki fè Donasyon pou (allrapkreyol.com) ap automatikman kalifye pou TOPSLIDE sit la. Chak $1 = Yon jou TOPSLIDE la. Fòs Donasyon ou ap detèmine konbyen jou Atis/Gwoup la ap ret poste nan TOPSLIDE. Send your soundcloud Artist page- Which can be updated anytime through your SoundCloud account. Just keep adding your latest music and it will appear on your ARK page.